Please note that images on this page are rights-free and no permission is needed from the Archives, provided you use the captions supplied below with each photo. Thousands of other images are available on the Archives’ Collection Search, but do require permission from our Rights and Reproduction team. Please also note that should you wish to use images from this page or the Archives’ collections for commercial use, you may need to pay a fee and/or obtain additional clearances from the Archives’ Rights and Reproduction team. The Smithsonian Institution Archives' Public Reference Room in Washington DC, by Ken Rahaim. Postgraduate Fellow in Conservation, Beth Antoine, Center for Archives Conservation, Smithsonian Institution Archives, by Nora Lockshin. The Smithsonian Institution Archives’ Collection Vault of Historic Photography with John Dillaber, Staff Digital Imaging Specialist, by Ken Rahaim. Charles D. Walcott, 4th Secretary of the Smithsonian, Grand Canyon in Arizona, 1915, Smithsonian Institution Archives, Historic Images of the Smithsonian, ID# 83-14116. William M. Mann (1886-1960), Former Director of the Smithsonian National Zoo, and Lucile Quarry Mann (1897-1986), writer and editor, 1940, Smithsonian Institution Archives, ID# SIA2009-0984. James Renwick Jr. Drawing of the Smithsonian Castle, Survey 11, Item 298, OPPS Neg# 92-9480, Smithsonian Institution Archives. 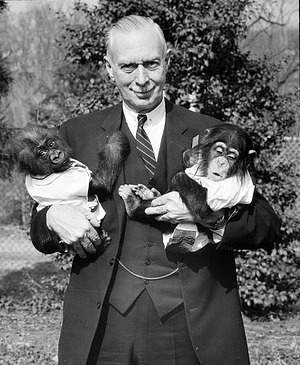 Smithsonian Secretary Leonard Carmichael at the National Zoological Park with a baby gorilla, Leonard (left), and chimpanzee (right), 1961, Smithsonian Institution Archives, Historic Images of the Smithsonian, Record Unit 95 Box 5 Folder 9, ID# 76-17992. 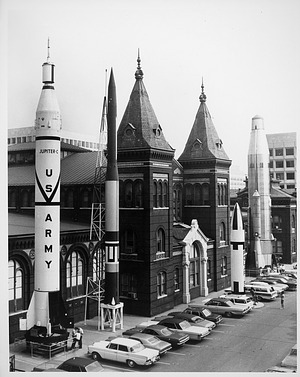 Rocket Row along the west side of the Arts and Industries Building before the National Air and Space Museum was built, 1960s, Historic Images of the Smithsonian, Smithsonian Institution Archives, ID# 2002-12168. 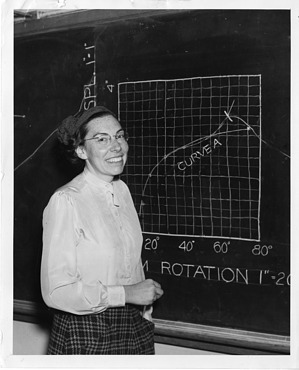 Mary Blade, Cooper Union Engineering Faculty, 1946, Science Service Records (1920s-1970s), Acc. 90-105, SIA Acc. 90-105, Smithsonian Institution Archives. How to Build an Acid-Free Records Storage Box, Smithsonian Institution Archives, 2011. Excerpt from Janet Harmon Bragg Video History, RU 9545 Black Aviators, Smithsonian Institution Archives.